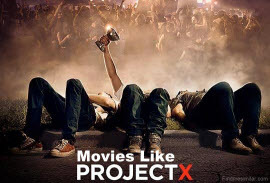 Movies Like Project X (2012) '+g+"
Project X is a 2012 comedy film directed by Nima Nourizadeh. The story follows 3 anonymous high school seniors Thomas (Thomas Mann), Costa (Oliver Cooper) and J.B. (Jonathan Daniel Brown) who plan to throw a birthday party that no one will forget. As the night progresses, word spreads and things go out of control. If you like teen movies like Project X then find the recommendations for it below and don't forget to mention if we miss any as we keep on updating this list. Superbad is a 2007 American comedy film directed by Greg Mottola and starring Jonah Hill and Michael Cera. Two co-dependent high school seniors are forced to deal with separation anxiety after their plan to stage a booze-soaked party goes awry. 21 Jump Street is a 2012 action-comedy movie directed by Phil Lord and Chris Miller based on an 1987 TV series of the same name. The story follows two underachieving cops (Jonah Hill and Channing Tatum) who are assigned an undercover operation of busting synthetic drug ring posing them as high school students. Multi character teenage comedy about high school graduates with different agenda of life on graduation night. American Pie (1999),.....if you can think of more, then don't forget to mention it in comments.